With some movies, suspense is quite literally in the air. Scientists at the Max Planck Institute for Chemistry and the Johannes Gutenberg University in Mainz, Germany, analysed the air in movie theatres during various movie screenings and determined that every movie leaves a characteristic pattern in the air. It is now possible to determine whether a movie scene is full of suspense, funny or somewhat boring, using chemistry. The Mainz researchers investigated how the composition of the air changed when an audience watched movies from different genres such as comedies like "The Secret Life of Walter Mitty" and "Buddy," or fantasy movies like "The Hobbit" and the science-fiction thriller "The Hunger Games." The researchers determined how the audience reacted to individual movies on a scene-by-scene basis. Using their analyses, they were also able to reconstruct which scenes were playing at the time. The chemical patterns are best defined during suspense or funny scenes. "The chemical signature of 'The Hunger Games' was very clear; even when we repeated the measurements with different audiences," says Jonathan Williams, group leader at the Max Planck Institute for Chemistry. "The carbon dioxide and isoprene levels in the air always increased significantly as the heroine began fighting for her life," the atmospheric chemist continues. Williams and his team are more usually involved in the measurement of gases from the Amazon rainforest. Isoprene is one of more than 800 chemical compounds typically exhaled by healthy persons in tiny amounts in addition to carbon dioxide. However, it is not yet known what physiological processes are causing the formation of the molecules. One explanation for the increasing carbon dioxide and isoprene levels, according to the Mainz researchers, is the fact that moviegoers tense up, become restless and breathe faster when watching scenes of suspense. Funny sequences consistently resulted in different molecular traces in the air than moments of excitement or suspense. "We can clearly differentiate the mass spectra," says Williams. "We were wondering whether it is possible to chemically differentiate between scenes in which different emotions are induced," says Williams, who has been studying the exhaled air of large groups of humans for some time, and has also used his devices during a match at the Mainz football stadium. Previously Williams wanted to find out whether human breath has a significant impact on the concentration of trace gases, such as the greenhouses gases carbon dioxide and isoprene. According to the analysis in the soccer stadium, it does not, and hopes for characterizing the football crowds' chemical reaction to a goal were dashed as the match ended 0:0. Therefore Williams and his colleagues decided to analyze human emissions during emotional experiences in a more controlled environment and came up with movie screenings. "It appears that we can measure whether there is suspense in the air," says Williams. He believes these exhaled air measurements have great potential for research into human respiration and with further characterization could allow us to investigate the human metabolism. Measuring the exhaled air of large groups of humans or "crowd breath" provides an alternative to studies of individuals, which are laborious and increasingly subject to ethical hurdles. There could also be practical applications for studies of air exhaled by large groups of people. The advertising industry could, for example, quickly and objectively measure how large groups of people react to emotional stimuli without having to conduct lengthy surveys. The team's study included a total of 16 movies, which were shown multiple times to audiences of different sizes. "The Hobbit" alone was shown 15 times. The researchers attributed different objective labels to all scenes of all movies, in order to assign them to the 30-second measurement intervals. The researchers had each film scene assessed, e.g. as humor, dialog or a fight scene, independently by ten volunteers . A scene label was only assigned when the subjective assessments of several researchers corresponded. The researchers installed their devices in the movie theatre's technical room to record carbon dioxide and more than a hundred other chemical components exhaled by the audience in the movie theatre's exhaust air. 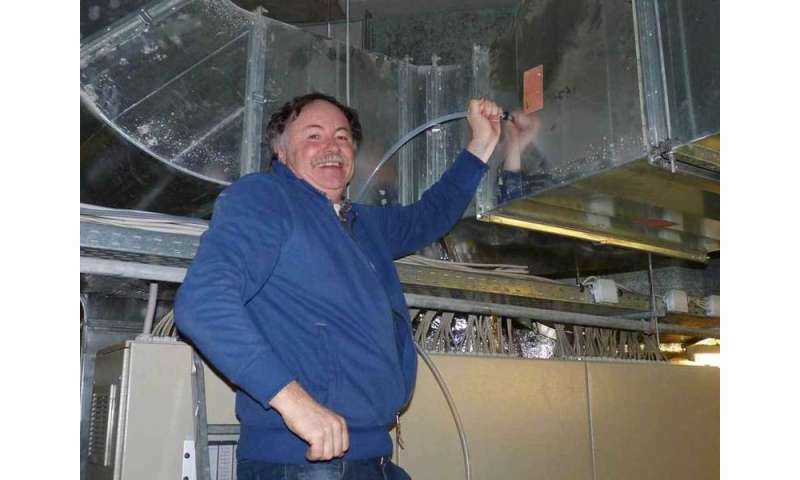 They inserted into the ventilation system the inlet of a mass spectrometer, which took measurements every 30 seconds. This device ionizes chemical molecules and then accelerates them in an electrical field to determine the mass to charge ratio of the chemical species. To analyze the data, Williams sought the assistance of Stefan Kramer, Professor at the Institute of Computer Science at the Johannes Gutenberg University in Mainz. This institute is one of the world leaders in the field of systematic data collection and analysis, also known as data mining. "In statistical terms, we got a clear chemical signal for humorous and suspenseful scenes, and were able to identify these even without seeing the movie," says Jörg Wicker, who developed the evaluation algorithms. Wicker and Kramer are already looking forward to continuing the study: Researchers are currently assessing chemical traces from audiences during the blockbuster "Star Wars."